I would not want this robot chasing me. Nothing stops it. Watch the videos after the jump to see it climb over piles of rubble and branches with ease. * and other dull, dirty, or dangerous tasks. Chaos is a robotic platform with four configurable and independently controlled tracks. Its superior design allows it to go where no other robotic platform of its size can go. 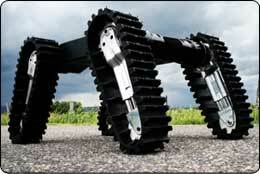 It can handle terrain like stairs, train tracks, rubble piles, gravel, and steep grades of loose debris. It was recently tested at Disaster City in Texas, the premier search and rescue training ground. There, in some of the most difficult terrain a robot will encounter, Chaos demonstrated its superior mobility. The basic Chaos platform is fully JAUS compatible. Chaos has the volume and weight capacity to handle the load of a wide variety of sensor and robotic payloads, such as an arm for EOD applications or senosrs for Hazmat situations. Chaos is supplied with Mobi, ASI’s handheld operator control unit (OCU) loaded with the Mobius software, the universal control for unmanned systems. Mobius supports operational modes from simple tele-operation to multi-vehicle autonomous behavior. The combination of Chaos, Mobi, and Mobius provides the power, design and intelligence you need to go to more places. Chaos, weighing in at 120 pounds, has more torque and payload capacity than any robot in its weight range. It uses an ultra-efficient motor and gearbox design to acheive impressive torque and an operational battery life of three hours. The design also makes it very quiet, with virtually no gear or motor noise. Chaos uses an ultra-efficient motor and gearbox design to acheive impressive torque and an operational battery life of three hours. Chaos is modularly designed, so all components (tracks, arms, drive modules, electronics module, battery, and chassis) can easily be replaced in the field. All components connect solidly together without any velcro or straps. If you happen to have missed the NOVA hour long documentary on the DARPA grand challenge you can now watch it from their website. This is why we love the internet. Carnegie Mellonâ€™s Robotics Institute recently developed software to be used in a deep-sea exploration project called DepthX. Deep Phreatic Thermal Explorer (DepthX) is a mission to deploy an autonomous underwater vehicle (AUV) to the bottom of Zacaton Cenote, a sinkhole in central Mexico over 1000 feet deep. 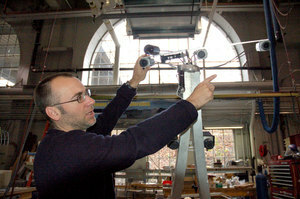 Dr. David Wettergreen of Carnegie Mellonâ€™s Robotics Institute developed the robotâ€™s navigational software. Wettergreenâ€™s past research has focused on robotics exloration, but this is his first underwater mission with Carnegie Mellon. Wettergreen said that the projectâ€™s ultimate goal is to study the sinkholeâ€™s underwater environment by collecting water samples while also creating a three-dimensional map of the sinkhole. â€œWe need a vehicle…that can move through complex cave systems without getting lost or trapped,â€? said Wettergreen. The vehicle is seven feet in diameter, and it can spin and move in any direction. Also, its buoyancy is very high, and the center of mass is very low, making it ideal for underwater exploration. â€œIt really wants to float upright in the water â€” it turns out to be extremely stable,â€? Wettergreen said. Project leader and Pittsburgh native Bill Stone of Stone Aerospace said that in the bottom of Zacaton Cenote, â€œthings get very complicated, very fast.â€? He said that SLAM is a clever way to determine the vehicleâ€™s location because it allows the vehicle to build a map of its three-dimensional surroundings. The map also includes information on the waterâ€™s temperature and salinity levels. Wettergreen said that previous explorations into Zacatone Cenote have not gone deeper than 30 meters. Nonetheless, these exploration missions have turned up some interesting results. In particular, the water contains low amounts of dissolved oxygen, and the waterâ€™s temperature is unusually warm â€” 90Â°F. Wettergreen said that DepthX may provide some data that explains these findings. In May of 2005, the robotics team tested the vehicleâ€™s sonar equipment in Mexico. According to the teamâ€™s field report, the sonar successfully reached from wall to wall, and researchers were able to confirm that the sinkhole neither widens nor narrows at a depth of 200 meters. Wettergreen said, â€œProbably, weâ€™ll find various kinds of slime and thatâ€™s what weâ€™ll be sampling, but no one really knows, this is really exploration into the unknown.â€? â€œItâ€™s more than just going from A to B to C to D,â€? Wettergreen said. â€œYou need a model for what measurements are more important than others.â€? The robot could also be used to explore Jupiterâ€™s ice-covered moon Europa. Stone said that a half-dozen planets have bodies of water that could contain life. â€œThe software technology can be applied to a number of underwater exploration problems,â€? Wettergreen said. When microbiologists search for microbial life, Stone said, they look for changes in the energy levels of an environment, which could indicate the presence of a warm spring. Similarly, the DepthX vehicle looks for microbial life by tracking energy gradients. â€œWeâ€™re simply giving these behavioral characteristics to the robot,â€? he said. Stone said, â€œThis system has to be able to survive the journey there, which is a completely different environment than weâ€™re looking in right now.â€? In particular, the vehicle must be built to handle space shuttle vibrations and thermal cycling, or energy change within a robotâ€™s motor. Wettergreen said that this is Carnegie Mellonâ€™s first project involving an underwater vehicle. He said that he would like to build similar systems in the future. â€œIâ€™m hopeful that this is something we can continue,â€? he said. ROBOT nurses could be bustling around hospital wards in as little as three years. The mechanised “angels” – being developed by EU-funded scientists – will perform basic tasks such as mopping up spillages, taking messages and guiding visitors to hospital beds. They could also be used to distribute medicines and even monitor the temperature of patients remotely with laser thermometers. Working in teams, the intelligent robots will be able to communicate with each other and co-ordinate their duties. Scientists from the universities of Warwick, Cardiff, Dublin and Newcastle are among the engineers and software experts taking part in the “IWARD” project. They aim to have a three-robot prototype system ready by 2010. It is hoped the machines will ease pressure on hospitals and free staff to spend more time with patients. By helping to keep wards cleaner, they could also cut infections by hospital superbugs such as MRSA. Each “nursebot” will consist of a mobile platform mounted with a module of sensors and equipment for different tasks. It might be fitted with a laser thermometer which can measure body heat from a distance, or cleaning equipment to mop up spills. While the hardware and modules can employ off-the-shelf technology, making the robots sufficiently intelligent and autonomous will require ground-breaking work. Project leader Thomas Schlegel, from the Fraunhofer Institute in Germany, has teamed up with experts from the University of Warwick to develop the advanced software. He told The Engineer magazine: “The idea is not only to have mobile robots but also a full system of integrated information terminals and guide lights, so the hospital is full of interaction and intelligence. 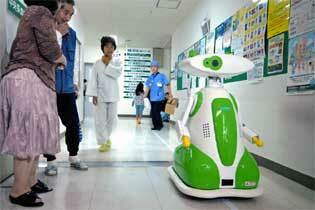 He said the robots could provide a valuable service guiding people around the hospital. A visitor would state the name of a patient at an information terminal and then follow a robot to the correct bedside. If the nearest robot was not sure of a patient’s location, it could seek help by communicating with others in the right area. The robots will be fitted with sensors and cameras, allowing them to avoid collisions while travelling through wards and corridors. High-speed lanes could allow them to move from place to place quickly. The robots would also employ face and voice recognition technology to communicate with patients and spot unauthorised visitors. “But the human-robot interaction will be tricky, as the robots will have to be able to deal with people with different injuries and disabilities as well as the elderly and seriously ill patients,” said Mr Schlegel.